The name of this ammonite species is Scaphites carilensis and it lived in what is present day western Kansas during the Late Cretaceous period. At this time a shallow seaway covered much of Kansas, as well as the middle part of this country. Modern day squid are the closest relatives of ammonites; ammonites are somewhat more distantly related to the modern pearly Nautilus. It is believed that they moved up and down in the water column throughout the day, and variably preyed or scavenged on small forms of marine life. 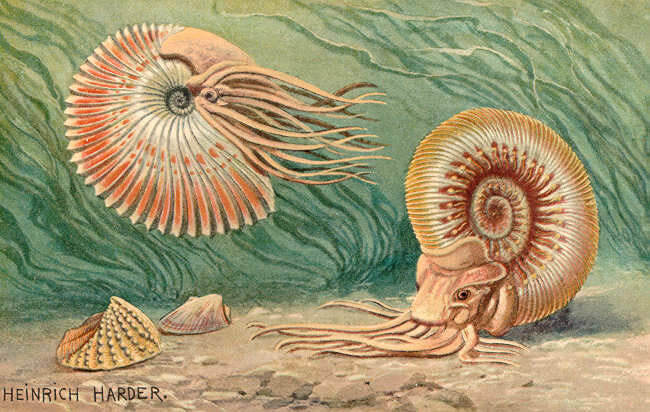 Ammonites are known for their rapid rate of speciation and extinction. The group as a whole went extinct at the large mass extinction event at the end of the Cretaceous period.